Good news for needle phobics! Floss Dental is excited to now offer a needle-free option to administer local anaesthesia. 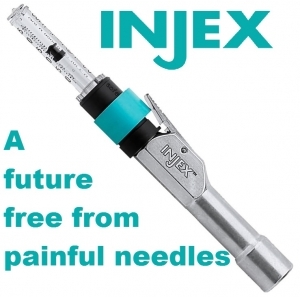 Injex is a revolutionary way of administering local anaesthetic without the use of a needle. The injector uses air pressure to deliver a fine stream of medication into the area to be numbed. One click and it’s all over – with no pain and minimal discomfort. The Injex cartridge is simply placed against the gums and the dentist presses the button. Patients describe the sensation as like a little “flick” and within seconds the tooth is numb.The system is used by other medical professions administer a range of medications, and is safe enough to be used daily by diabetics to inject insulin.For more information about injex, please send us a message or pop by our clinic.